Thorogood's Hellfire fireboots provide the protection you demand. A worry-free design makes sure the only thing you need to concentrate on is fighting the fire. 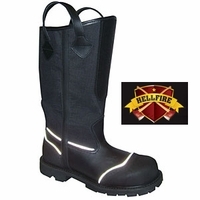 Hellfire boots take care of your feet with heat, slip, water, and puncture resistant engineering. Safety, durability, and comfort are combined in a boot that delivers performance when ever advantage counts. Proven durability ensures long-lasting duty life, a testament to Hellfire boots' ability to go on Working Over Time.